Purpose: Masked hypertension (MH) independently predicts mortality but cannot be diagnosed from clinic blood pressure (BP) taken under resting conditions. We sought to determine if MH could be identifi ed from BP taken during a single bout of low-intensity exercise. Methods. 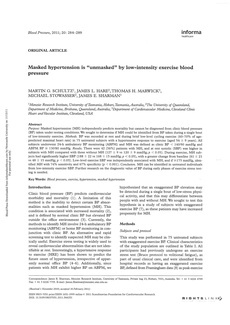 BP was recorded at rest and during brief low-level cycling exercise (60 – 70% of agepredicted maximal heart rate) in 75 untreated subjects with a hypertensive response to exercise (aged 54  9 years). All subjects underwent 24-h ambulatory BP monitoring (ABPM) and MH was defi ned as clinic BP  140/90 mmHg and ABPM BP  130/80 mmHg. Results. There were 42 (56%) patients with MH, and at rest systolic (SBP) was higher in subjects with MH compared with those without MH (127  9 vs 120  9 mmHg; p  0.05). During exercise, MH subjects had signifi cantly higher SBP (188  22 vs 168  15 mmHg; p  0.05), with a greater change from baseline (61  21 vs 48  15 mmHg; p  0.05). Low-level exercise SBP was independently associated with MH, and if  175 mmHg, identifi ed MH with 74% sensitivity and 67% specifi city ( p  0.001). Conclusion. MH can be identifi ed in untreated individuals from low-intensity exercise SBP. Further research on the diagnostic value of BP during early phases of exercise stress testing is needed.